The Queen’s Gurkha Engineers excelled on Exercise GRIFFIN CHALLENGE 2016. The event took place on 3rd November 2016 at Pirbright, Surrey. Gone were the days just to clap to the winners, whilst ourselves satisfying with 5th and 8th position for the last two episodes of the GRIFFIN CHALLANGE. Yes, this year’s GRIFFIN CHALLENGE was ours, finally ours, with so much of anticipation and hype before the challenge itself. It felt as if it came back to where it belonged; 8 Engineer Brigade. 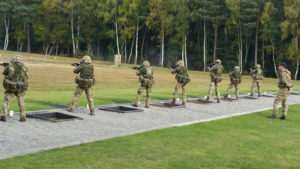 Exercise GRIFFIN CHALLENGE is a demanding military march and shoot competition that took place at Pirbright. The challenge tests physical stamina, combat agility, combat shooting, military knowledge and mental robustness. Basically, it included ten teams from the Force Troops Command which comprises 10 brigades under the command of Major General Urch CBE. The challenge was to march six miles with 25kg load including personal weapon. Consequently, kit inspection at first and then it had a 500m-log race after two miles point. Furthermore, at the four miles point, there was a stand for military knowledge and observation. Once, the six mile point was completed the obstacle course was the final physical test which included twenty-five of the most grueling obstacles. Finally the last part of the challenge was the shooting competition, where every team had to shoot from 400m, 300m, 200m and 100m. 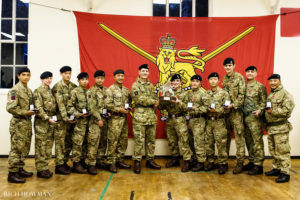 The competition was immensely tough and competitive as each brigade had the very best team selected across the brigade. Our team managed to secure 1st position and the team collected the highest number of points, 50 points from the possible 60 points. This score is the highest score achieved by a team since the competition commenced! The competition is mainly aimed at building team work, effort and team bonding. As it is said, well planned is half done, thus our team have had best training and planning before the start of the challenge itself hence we were victorious. Finally, we are looking forward for the GRIFFIN CHALLENGE in 2017.